Arg. Charts H-116, 118, 155, 156. BA Charts 1749, 1851, 2039, 3561. 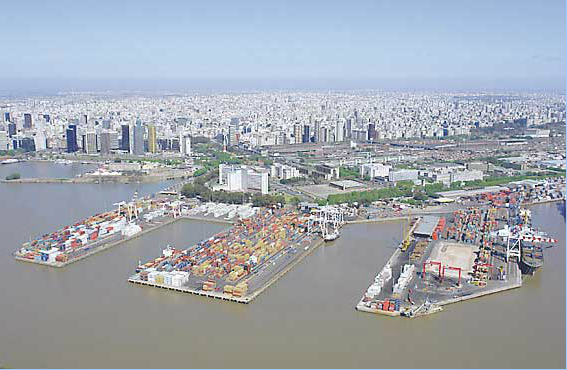 The port of Buenos Aires, which forms part of the city, is situated on the right hand margin of the River Plate and all river distances are calculated from this point (km 0). Buenos Aires is the seat of the national authorities. It covers an area of 200 sqkm and has 3.058.000 inhabitants (2010 est.). In practice, the greater Buenos Aires urban conglomerate includes 24 counties in the province of Buenos Aires (although the city is growing and incorporating new areas) covering 3830 sqkm and has a population of about 12.000.000. In the downtown area of the city, very close to the port, are the seats of the executive, legislative and judicial powers and all the administrative departments thereof. The authorities of the Buenos Aires city government are also in the same area (the city has a special status, not unlike that of the Argentine provinces) and its various administrative departments are spread all over the city. The downtown area concentrates most of the financial activity and most shipping companies and ship agents are also there. The industrial and commercial enterprises, as communications got better, have slowly moved out their offices to the outskirts of the city, although most of them still have their administrative headquarters downtown. 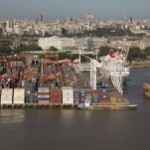 The greater Buenos Aires area is the largest industrial conglomerate in the country, being in the first place in production volumes in the country, except in the agricultural, mining and steel mill industries. The intense city traffic has been somewhat improved with a network of urban and suburban freeways which permit a swifter transit in and out of the downtown/port area. The highways served by these freeways constitute a virtual spider web that spreads out from the center of the city. There are railway connections with most of the country through seven railway lines which also have suburban passenger services. The commercial airlines are served by the Jorge Newbery airport, which is only 10 minutes away from the downtown area and handles all domestic and regional flights, and the Ezeiza (Ministro Pistarini) International airport which handles most international flights and is 40 km away from the downtown area and connected by a freeway. There is also another airport which can handle international traffic (San Fernando) and various smaller airports. The El Palomar Air Force base is used by Air Force and Navy transport services and also has a passenger terminal. 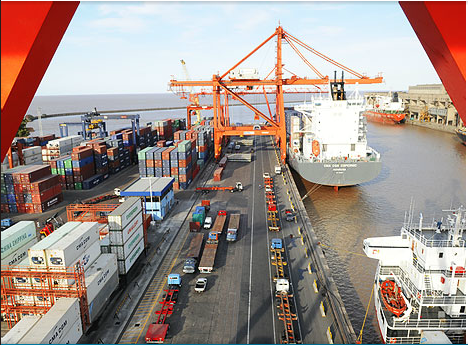 The following information refers to the port of Buenos Aires, which includes Puerto Nuevo (New Port), North and South Basins, Dock Sud (South Dock) and neighboring installations. Attention and treatment available at all levels from a wide variety of Public and Private Hospitals and Clinics. Medical attention to crew members is normally provided through ship´s Agent but Prefectura Naval (Coastguard) can be called upon in an emergency. Ambulances, launches and helicopters can be provided either by ship’s Agent or Prefectura Naval in case of serious illness or accident requiring immediate attention. 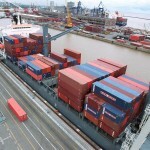 Flat rates are quoted by all terminal operators as also by stevedoring concerns operating at Dock Sud open berths, therefore the question of working hours, conditions and rates of pay are matters for the shipowner´s consideration only insofar as they affect the rate quoted and time of vessels stay in port. GMT (UTC) -3 h. -(Government may stipulate daylight saving time shift to GMT -2h ). Despite the fact that, for the most part, Argentina lies west of longitude 60¡W, local time throughout the country is kept at GMT-3 h.
10th November (Does not affect shipping business). Prefectura Naval(Coastguard) SECOSENA and CONTRASE control and information systems for ships in Argentine waters. Coastal radio station Buenos Aires Prefectura Naval Radio L2G weather forecasts callsign L2B, L2C, F, L2G, various frequencies. RAILWAYS: An extensive network covers a large part of the country and there are seven main-line Terminals in Buenos Aires. Railways, like many other services in Argentina have been privatized or granted in concession, whereby services which had fallen to a low level are gradually improving. Agents should be consulted if inland on-carriage by rail is contemplated (see also private terminals for details). Frequent passenger train services operate between the Capital and its suburbs and the city is also served by five Underground (Subway) lines. A numerous and wide variety of trucking services are available for the movement of cargoes, including heavy lifts. Ample passenger bus services cover the city and the country in general. There are excellent long distance bus services including some which extend to neighboring countries. FERRY-BOAT SERVICES: Regular services are maintained by fast modern ferry-boats to the Uruguayan ports of Colonia, Montevideo and Piriápolis. For domestic flights and some flights to and from neighbouring countries the city is served by the Jorge Newbery Airport located within the city itself on the north riverside and for international flights by the Ezeiza Airport, located further inland about 40 km from the city. Requests are made directly to the Terminals and the Port Administration (AGP) must also be kept informed. 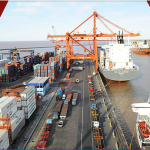 For all Dock Sud berths, application must be made to the Dock Sud authority (Delegación Dock Sud) and to the terminal operators via the ship´s agent. Free pratique: Must be requested by cable, telex or fax (see “Free Pratique and Cholera” on Part 1, Chap.Five) via ship´s agent but is only granted on the Port Health Doctor´s visit alongside. At the first port of call vessels must fly the “Q” flag on entry. As reference (September 2012), the limiting depth in the Main Channel between Recalada and Zona Común is approximately 10,50 (34′ 4″) at datum in a channel width of 100 m. From Zona Común the limiting depth in the Access Channel is approximately 10,80 m (35′ 5″) in a channel width of 100 m. From km 12,0 to km 0 in the North Channel the limiting depth is approximately 10,36 m (34 ft) at datum in a channel width of 80 m. From km 6,8 to km 0,1 in the South Channel the limiting depth is approximately 10,20 m (33´5´´) at datum in a channel width of 90 m. Considering this is a dredged channel, this data must be thoroughly checked (see comments in next paragraph on maximum draft). PUERTO NUEVO, NORTH BASIN AND ANTEPORT APPROACHES. Speed within approach channels km 1 to 15 must not exceed 14 kph (7,5 knots) and within port limits 6 kph (3,2 knots). When passing dredgers, speed must be reduced to minimum necessary to maintain steerage way. In accordance with present regulations vessels are prohibited from meeting in the North and South Channels and in the access channel from km 0 (anteports) to km 11 and from km 12 to km 16. In case of need a departing vessel must wait on the berth or anchor in the anteport until the incoming vessel has cleared the channel. Overtaking is not permitted in the North, South and Access Channels and (ocean going) vessels are required to keep a minimum distance apart of 1 km. 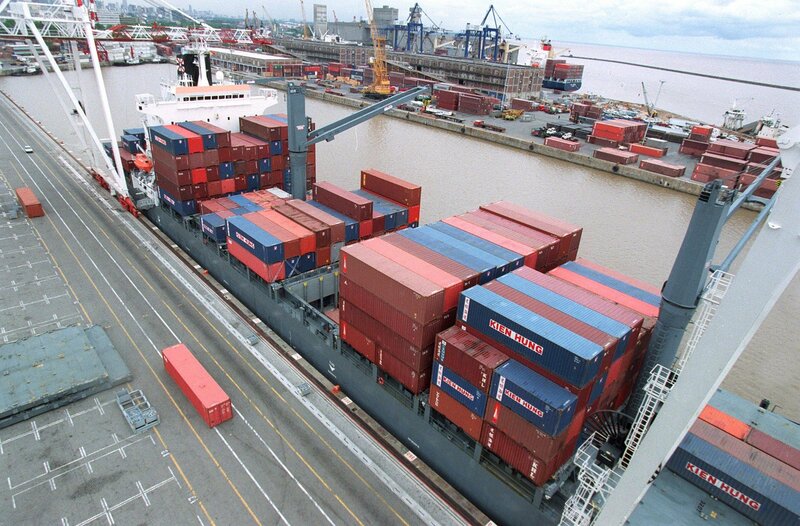 No maximum draft is stipulated for the port of Buenos Aires and vessels should proceed, or not, according to existing conditions. In this respect drafts of around 9,70m (32 ft) FW, taking advantage of the tide, are not uncommon. However, due to varying conditions of tides, winds, depths in channels and alongside, Masters should treat this matter with great care, consulting Agents and pilots as needs be, the usual criteria being least channel depth, minus two feet obligatory UKC in port access channels and main channels, plus an allowance for the height of the tide. No maximum length is stipulated for vessels entering the port. In this respect Panamax type vessels regularly operate, and Cape size vessels occasionally berth. It should be noted that not all berths are suitable for vessels of the above L.O.A. and drafts and the matter should be treated with the respect and caution it deserves. Once berthed, vessels are not permitted to immobilize main engines without Coastguard permission. 1. All ships must berth bow out (facing the dock/basin entrance)(exceptions have been granted to this rule). 2. Agents must advise Prefectura Naval (Coastguard) at least 12 hs beforehand of any expected movement to permit traffic coordination and vessels are prohibited from meeting in the South Channel. At all berths in Dock Sud section 2, Gas Carrier (Dársena de Propaneros) berths and Tanker Basin (Dársena de Inflamables) the maximum permitted beam is 32 meters (exceptions have been granted). 3. In Dock Sud section 2, the Tanker Basin (Inner Section) and the Gas Carrier Terminal, vessels are limited to a maximum beam of 32 m for daylight entry and sailing and 28 m for nighttime operations. 4. At Dock Sud section 1, the maximum permitted beam for vessels berthing at the Exolgan Container terminal is 42 m. There are special PNA limitations in the case of vessels berthing second off in section one. 5. 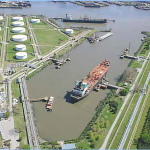 At the Gas Carrier terminal, berthing is limited to a maximum of two vessels at any given time. 6. Vessels of up to 22 m beam when entering or sailing via the South Channel by night must at all times maintain a clearance under the keel of 0,3 m (1ft) on a rising tide or 0,6 m (2 ft) on a falling tide. In the case of vessels with a beam exceeding 22 m, these figures are increased to 0,4 m (1,5 ft) and 0,9 m (3 ft) respectively. 7. Vessels drawing more than 4,25 m (14 ft) must request authorization from Dock Sud Prefectura Naval (Coastguard) when other craft are required to berth alongside second off; also indicate nature of operations to take place and size of craft berthing second off. In actual fact nowadays Masters and Pilots of all craft are obliged to keep the Coastguard advised of their movements at all times and to obtain their consent before proceeding. 8. Vessels are not permitted to immobilize main engines in Dock Sud and should this be necessary then two tugs must be on stand by alongside throughout. Tides are semi-diurnal and the height of the tide can be notably influenced by the force, direction and persistency of the wind; so much so that, in the case of SE´ly gales (Sudestada) tides of 1 to 2 m (say 3 to 6 ft) above the tabulated values are not unusual. Also tides of several feet below the tabulated values can be experienced when steady N´ly winds set in. Additionally somewhat lower tides can be experienced immediately following a prolonged blow from the South and somewhat higher tides following a prolonged blow from the North. It should be noted that whilst times of high water are, as a rule, not affected by the wind, the effect of winds from ENE, backing through N to SW, usually retard the times of low water, whereas winds from the North, veering through E and S to SW usually advance same. 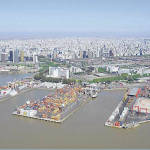 Critical high water level at the port of Buenos Aires is considered to be +2,7 m. (+9 ft). As per tidal predictions (Dec 2012):HAT 1,51 m LAT 0,28 m. MHW 1,08 m; MLW 0,61 m. WARNING: Tide levels can´t be predicted by usual methods and should be consulted locally. A) For vessels proceeding to/from Montevideo or Recalada the port pilot embarks/ disembarks at these points thereby avoiding anchoring/delays at the roads (Zona Común). 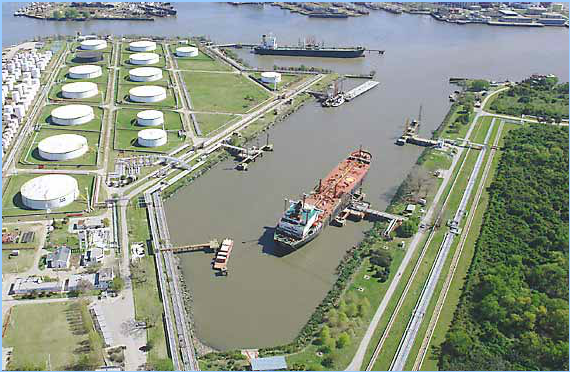 b) For vessels proceeding to/from up-river to/from Buenos Aires the port pilot can embark/disembark off Escobar (Paraná river km 68). Under these conditions the vessel can depending on circumstances be swung at km 20 or thereabouts, thereby avoiding the need to proceed right out to the roads (Zona Común) at km 37 approx. Various private tugs companies operate at Buenos Aires; units´ powers ranging from 2400 up to 4100 HP and from 1200 up to 1800 HP As per Coastguard regulations 2 tugs must be used on entering, sailing or shifting, but there are exceptions. a) That the hydrometeorological conditions are favorable. b) That the bow thruster is in good working order and is sufficiently submerged to function efficiently. c) That the dispensing of use of tugs does not interfere with the maneuvering of other vessels and that there is sufficient room to navigate and maneuver with safety within the port. a) That the vessel is berthed bow out. b) That the wind velocity does not exceed 30 km/h. c) The wind velocity shall be that recorded by the Coastguard. NOTE 3: In all above cases a 5% tolerance with regards to vessel´s LOA is permitted. NOTE 4: Tugs are not required for warping along the quay. NOTE 5: Tugs on entry must be made fast as from km 3, whilst on sailing may cast off as from km. 1 (after tug) and km 2 (forward tug). Available to assist with mooring operations, inspections, draft surveys, etc. All vessels are required to be well fendered off when alongside and fines are made if this is not done. In the case of the Puerto Nuevo Terminals, all have suitable fenders on their principal berths as does also Exolgan Terminal. All mooring lines are required to be fitted with ratguards of 80 cm diameter. Non compliance entails fines. Refuse skips can be supplied via agents/terminals. A number of firms are available who specialize in the fumigation of cargoes of ship´s holds and accommodation. The employment of gangway watchmen is compulsory for all foreign flag vessels over 2000 GRT. All types of repairs, including underwater repairs can be carried out by specialized workshops or local shipyards. Prefectura Naval permission is required for hot work (obtained by workshop), or immobilization of main engines (obtained by Agent). Additionally permission to carry out repairs must be requested from terminals by fax. See Tandanor syncrolift dry-dock complex located off South Channel, east basin km 0-0,7. Available on short notice to carry out underwater repairs, salvage operations and/or inspections in conjunction with Nautical Surveyors. Can be carried out in the roads. Early advice necessary and advisable Adjuster visits vessel to inspect equipment beforehand. Offered by a number of private companies and also by PNA Technical Dept. Floating pontoons, submersible pumps, lifting gear, ground tackle and diver services available. Servicing of emergency life rafts and equipment, CO2 gas bottles, fire extinguishers, smoke detectors available from recognized firms. Normally all grades available provided notice given in good time beforehand. Can usually be dealt with at oil terminals but this should be checked beforehand. At general cargo berths collection by road tanker can be arranged without difficulty. If slops more than 80% oil then Service is without charge. In case of generator breakdown in board, power (220-380v) can be supplied from shore, either from port installations or by hiring portable generators. See terminals for details of equipment available. Stevedoring companies outside these terminals have equipment sufficient for their needs and a number of mobile cranes of varying lifting capacities are available for hire. The following are usually available but prior confirmation in good time essential due to possible need to re-commission these craft. With regard to weights to be lifted, the cranes outreach for such weights should be carefully checked. Outreach: 34 m from bow. Distance between hooks about 18 m.
1) main boom 400 m/ton with 2 hooks. outreach: 11 m from bow. Height of hook above pontoon 30 m.
2) Jib boom 200 m/ton with 2 hooks. Outreach: 26 m from bow. Height of hook above pontoon 42 m. Propulsion: 2×250 HP schottel engines 1×140 HP bow thruster. 1) main boom 500 m/ton with 2 hooks. Outreach: 11 m from bow. Height of hook above pontoon 30 m.
2) Jib boom 300 m/ton with2 hooks. Outreach 19 m from bow. Height of hook above pontoon 46 m. Populsion 2×328 HP schottel engines 1×180 HP bow thruster. Normally available at all Newport and North basin berths from shore, but flow rate depending on circumstances may be weak. 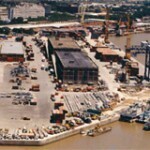 At all Dock Sud berths Supply is by barge only. Water barges are available for supplying all berths and are frequently necessary in the case of vessels with limited time alongside. Permits issued by Prefectura Naval or Terminal operators are necessary in order to visit vessels in port and agents should be consulted. Crew members are required to carry their Argentina identity card when ashore. Terminal 1,2 & 3 (TRP): fitted with super post-panamax container gantry cranes. Heavy lifts up to 100 ton. Terminal 4: Container handling and heavy lifts with 2×35 ton drolt mobile crane and 2×100 ton leibherr mobile crane. Terminal N º 5 (BACTSSA) Container handling with super post-panamax and post panamax container gantry cranes; on consideration accepts RO-RO vessels, neo-bulk cargoes and can handle heavy lifts up to 120 tons with two gotwald craned in tándem. Exolgan container terminal (at Dock Sud), fitted with super post-panamax and post-panamax container gantry cranes and additional equipment. Actually inactive. 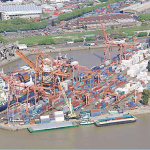 The port administration is studies to offer the concession to new operators by public tender. Grain: Terbasa terminal ( at Puerto Nuevo), from grain elevators (ex national grain broad) at Basin D south side (storage capacity 175000 ton). EX – ACA Elevator (at Dock Sud, section 2 west side): ( Storage capacity 16000 ton) Presently inoperative. AGRI BY-PRODUCTS: Puerto Nuevo: As above. FERTILIZERS: Terminal 4 (at Puerto Nuevo, usually) or at Dock Sud, Section 2 west side: Discharged by grabs to trucks. SODA ASH: Dock Sud, Section 2: As above. VEG. OILS: Puerto Nuevo: By road tankers at open quay berths. WINE/WINE MUST: Puerto Nuevo: By road tankers. PETROLEUM PRODUCTS: At Tanker Basin (Darsena de Inflamables) off South Channel (km 0,3) and occasionally at Dock Sud Section 2, east side. At South Dock Section 2 East Side. Brought in when required by tankers berthing directly alongside at Pierhead 5. Port lighters no longer available/in use. Barges and feeder vessels for on carriage of up river cargoes available. Pallets in general	200-250 per gang per 6 hour shift. Bags 50 kg loose	6000 per gang per 6 hour shift. Big bags 1200 kg	250 per gang per 6 hour shift. Newsprint, etc. 200 ton per 6 hour shift. Cars (ex ro-ro vessels)	150/200 per hour. Steel pipes	150/200 ton per gang per 6 hour shift. Steel coils (CRC)	500 ton per gang per 6 hour shift. 1. 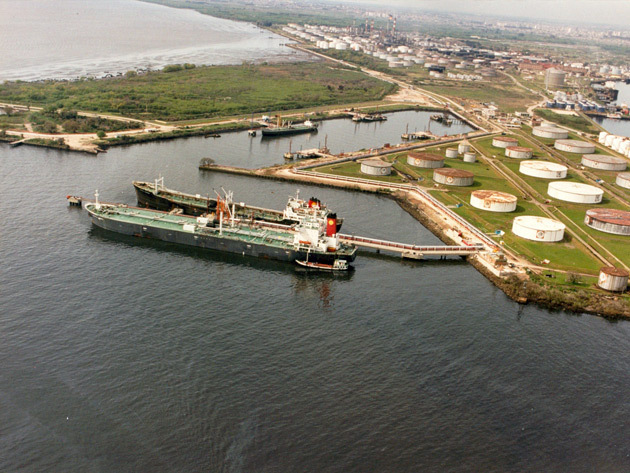 Puerto Nuevo has been divided into six terminals (Terminals 1, 2 and 3 have been combined as one terminal), plus the Grain Elevator, and the General Port Administration (AGP) has let these out as concessions via public tender to private operators; these are against certain guarantees and the payment of a yearly canon. 2. Private operators continue investing considerable sums of money to maintain up to date equipment at these terminals, including the strengthening and repair of quay walls as well as the repaving of quay and storage areas. 3. In accordance with contracts Terminal operators were obliged on a pro-rata basis to accept Stevedores and AGP personnel and these have either been given severance pay or absorbed as operational staff alongside non-union, non-port labour personnel with the resultant peace and efficiency necessary for satisfactory operations. This has resulted in the terminals being able to work 24 hours a day, 365 days a year, at improved rates, with Shipowners being offered attractive flat rates for loading and discharging operations. In addition it has resulted in a dramatic reduction in the amount of pilferage. 4. Computerized services have been established by Terminals, Shipagents, Customs and Owners, providing rapid communications between all parties. 5. Customs procedures have been much improved by the introduction of the María computerized service. This service is connected to all shipping agents and terminals with the consequent speeding up of operations. 6. 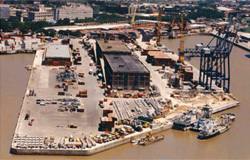 The Exolgan private container terminal in Dock Sud section 1 entered into service in 1995. 7. In conjunction with these improvements, the Puerto Nuevo basins have been dredged to around 10,00 m at datum and at the Exolgan terminal in Dock Sud depth alongside is given as about 11,00 m at datum. As mentioned before, due to varying conditions of tides, winds, depths in channels and alongside, Masters should treat this matter with great care, consulting Agents and pilots as needs be. 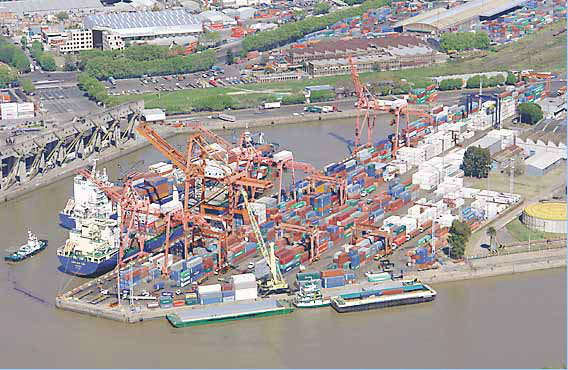 a) Berths in North Basin remain under AGP control and are presently not used for cargo operations; however, two crossriver passenger ferries have their terminals on the western and eastern sides of the basin. Both operate fast daily services to Colonia, Montevideo and Piriapolis with craft capable of over 40 knots, scheduled time to Montevideo being less than 3 hours. b) Puerto Madero, Docks 1 to 4 are no longer in use. 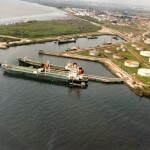 c) No important structural changes have taken place in South Basin, East Basin Dock Sud section two, the Tanker Basin (Dársena de Inflamables) or the Gas Carrier Terminal. d)The Riachuelo is not used by ocean going shipping. (Note: all depths alongside berths & piers must be considered as a reference. For actual data, contact agencies or check the Boletín Fluvial at http://www.sspyvn.gov.ar/boletinfluvial.html ).